Joseph de Bologne was born December 25, 1745 on a plantation near Basse-Terre, on the French Caribbean island of Guadeloupe. His mother was Anne Nanon, slave-mistress of his father, the nobleman George de Bologne de Saint-Georges. He was educated in France, where his father became Gentleman of the King’s Chamber. At 13, he began 6 years at the fencing academy of Nicolas Texier de La Böessière. He excelled at fencing and sports. Joseph was 17 when he became Le Chevalier de Saint-Georges. He was also an Officer of the King’s Guard. By age 19, Saint-Georges was called “the god of arms.” He suffered only one known defeat in a serious fencing match. His skill on the harpsichord and violin earned him dedications from major composers, beginning with Antonio Lolli in 1764. He studied with the French composers François-Joseph Gossec and Jean-Marie Leclair, and became first violin, or concertmaster, of Le Concert des amateurs. His string quartets were among the first in France and were performed from 1772 and published from 1773, when he was became conductor of Le Concert des amateurs. His bid to manage the Paris Opera failed when 3 women objected to working for “a mulatto,” but he then directed the prestigious musical theater of the Marquise de Montesson. He published two symphony concertantes in 1776 and two more in 1778. In 1777 he wrote three violin concertos and six string quartets. 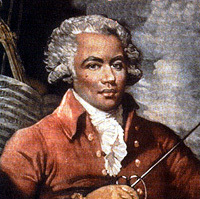 Early in 1779, Saint-Georges began performing music with Queen Marie-Antoinette. He was an early Black Mason in France. When his orchestra closed, Masons organized the Concert de la Loge Olympique. During the French Revolution, Saint-Georges was Colonel of 1,000 volunteers of color and heroically halted “The Treason of Dumouriez.” He was imprisoned for 11 months on false charges, then acquitted. He took control of Le Cercle de L’Harmonie in 1797, and died on June 10, 1799. Dozens of CDs of his music are available, as is a DVD, Le Mozart Noir. Gabriel Banat, The Chevalier de Saint-Georges: Virtuoso of the Sword and the Bow (Hillsdale, New York: Pendragon Press, 2006); http://chevalierdesaintgeorges.homestead.com/Page1.html.